CULLMAN – Cullman Mayor Woody Jacobs today donated 50 U.S. flags, on behalf of the City of Cullman, to Cullman's Veterans of Foreign Wars Post 2214 for display throughout the city during patriotic holidays. 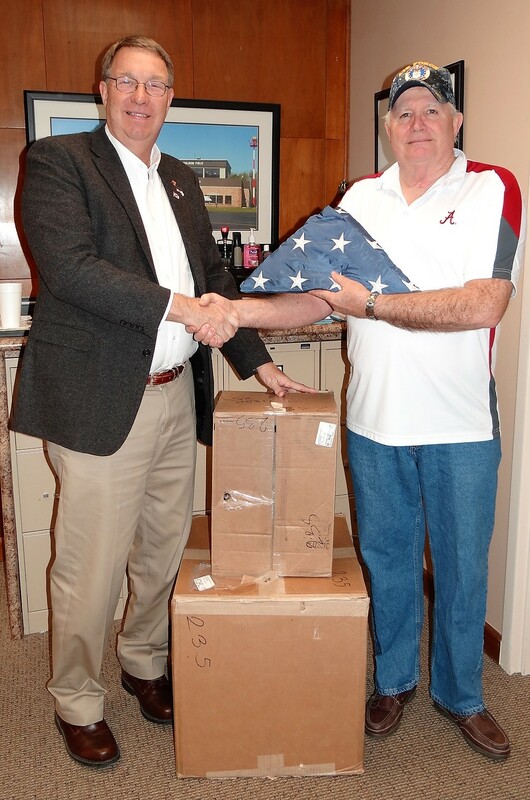 The mayor and city council recently purchased the 4' x 6' flags from the Office of Congressman Robert Aderholt, R-Alabama. Jacobs presented the flags to VFW member Sam Bates on Friday. The Cullman VFW places the flags alongside major highways during patriotic holidays to honor both living and deceased veterans from the Cullman area. The flags have to be replaced quite often. The VFW has a “flag fund,” and they accept donations to continue purchasing flags for this purpose. Those wishing to donate to this fund may send a check or money order made payable to VFW Post 2214 to 112 Veterans Drive SW, Cullman, Alabama, 35055. All donations are tax deductible. Call 256-739-6611 for more information.